Use Windows Mail to set up an e-mail account. To set up an e-mail account in Vista, you need these three things, all available from your Internet Service Provider (ISP): your username, your password, and a working Internet connection. 1Set up your Internet account and open Windows Mail. To call up Windows Mail for the first time, open the Start menu and click the Windows Mail icon. If you don’t see this icon, choose All Programs and then click Windows Mail. Windows Mail hops onto the screen, ready to be set up to send and receive your e-mail, as shown in this figure. If this figure doesn’t appear automatically, open Windows Mail and choose Accounts from the Tools menu. Click the Add button, choose E-Mail Account, and click Next. 2Type your name and click Next. 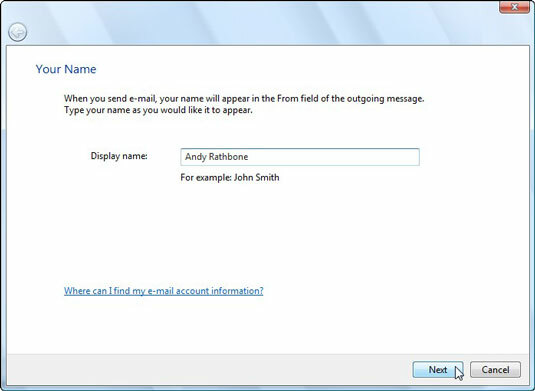 This name appears in the From box of all your e-mail, so most people simply type their own name. 3Type your e-mail address and click Next. Your e-mail address is your username, the @ sign, and your ISP, all information that your ISP must provide you with. 4Choose your server type and the names for your incoming and outgoing mail servers and click Next. Here, you need to know what type of e-mail account the service uses. It’s a weird word like POP3 or IMAP. (If it uses HTTP, Windows Mail can’t work with it.) Most ISPs send you these handy settings and instructions through the post office. Google’s Gmail, AOL, and Yahoo! all require you to click the box marked Outgoing Server Requires Authentication on this page. 5Type your account name and password and click Next. For your account name, enter the part of your e-mail address before the @ sign. Then type that account’s password. Check the Remember Password box to fetch your mail automatically in the background. That’s it. Windows Mail should immediately fetch any waiting e-mail and let you begin sending e-mail.